It has been a long process involving many people, but the construction of the Main Line Eruv expansion is finally nearing completion. What started as an informal discussion around a dining room table in 2002 is now becoming a reality for our Jewish community. 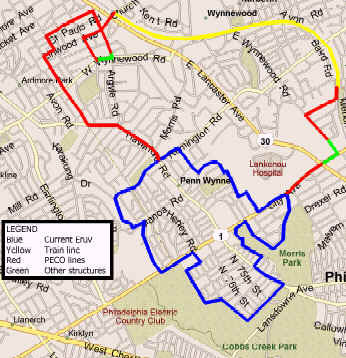 According to the project schedule, the expanded Main Line Eruv (MLE) will be up by Rosh Hashanah in September. The expansion of the Eruv will more than triple the size of the current MLE. It will include most of Wynnewood (including Lankenau Hospital), and parts of Ardmore, Merion, Narberth, and Overbrook. The most visible person in the Eruv expansion project is Rabbi Szmerla, who is doing the construction. You may see him in his white van with the cherry picker along the boundaries of the Eruv, attaching gray PVC pipe to telephone poles and string in between the poles. The MLE project is the result of a joint effort and cooperative relationship between Congregation Beth Hamedrosh and a charitable organization known as Keruv. Rabbi Caplan of Beth Hamedrosh is the halakhic authority over the Eruv. Keruv was formed for the specific purpose of facilitating the Eruv expansion. The Keruv organization was founded by a group of families living in the neighborhoods around South Ardmore Park and Remington Park. These families have been conducting home-based Kabbalat Shabbat services on Friday nights and sharing community meals, Shabbat Mincha and learning on Shabbat afternoon for several years. Its members belong to various synagogues, including Ahavas Yisroel-Chabad, Congregation Beth Hamedrosh, SJCC-Bnai Aaron and Temple Beth Hillel/Beth El. The construction of the Eruv will facilitate community meals, allow for the use of strollers, and foster a stronger sense of community and inter-denominational cooperation. Construction of the Eruv expansion has involved remarkable cooperation from many local and regional entities, including Lankenau Hospital, Saunders House, and PECO. Perhaps the most interesting community cooperation can be witnessed in the recent permission from the St. Charles Borromeo Seminary to allow MLE to use its fence line as part of the Eruv. "We were already thrilled at the tremendous cooperation between the local Orthodox and Conservative Jewish communities in making this project a reality; having the St. Charles Seminary participation adds to the true sense of community building that the Eruv expansion has been able to achieve", said one Keruv organizer. To learn more or to become an annual supporter of the Eruv, kindly contact the author. David Oppenheimer is an in-house Consultant for Interline Brands, a national distributor of building supplies. He is also President of Robin Hood Ventures, an angel investment group supporting startup businesses in the Philadelphia metropolitan area. See article in this issue on the Halacha of Eruvin.